Prices stated are a guide only, assuming dogs are in a reasonable condition, parasite free, within the standard size for the breed and also that the dog is happy to be groomed. A full assessment of your pet will be made at the consultation. 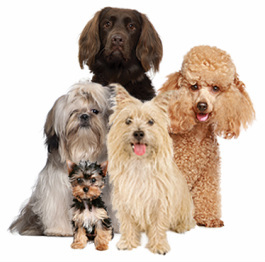 If you cannot see your dogs breed on the list please call us on 07912 619224 for a no obligation quote. Please ensure that your dog has had a toilet break before coming to us as a typical appointment lasts around 2 hours. Owners are asked to leave their dog with us for this time and we call or text you when we are almost done so as to minimise the time the dog is waiting. Unfortunately we cannot offer day care services so please be available to collect your dog when notified.